Sundyne's LMV-803Lr ultra-low NPSHr, high-flow pump. Once commissioned, they will pump natural gas liquids from the bottom of the demethanizer to plant battery limits. The LMV-803Lr is the high-flow variant of the Sundyne LMV technology in a direct-drive package. 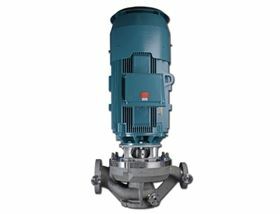 The LMV-803Lr features Sundyne inducer technology and a backswept impeller, allowing it to reach lower NPSH requirements than competitive models without risk of cavitation.